Safe and clean drinking water became a lot easier to access today at the Kimanza Secondary School and Kwasyokimanza Primary Schools in Matungula District thanks to an initial donation by Danish consumers of 27,000 high-tech LifeStraw® water purifiers through a partnership including Coca-Cola®, Vestergaard Frandsen and Water For All. Today’s donation by Danish consumers represents the bulk of some 35,000 LifeStraw® water purifiers that will arrive throughout Kenya this year. According to a 2006 report from the United Nation’s Development Program, waterborne diseases were estimated to cause 1.8 million deaths each year while about 1.1 billion people lacked proper drinking water. The problem is especially severe in Africa. In Kenya alone, 40% of the population lacks access to clean and safe drinking water, resulting in millions of cases of diarrheal disease each year, serious illnesses, preventable deaths, lost productivity and absenteeism from school. The project started in April 2010 under the banner of ‘3 litres of clean water’ as a partnership of the three companies with the aim of donating three litres of clean and safe water to Africa for every purchase of Kildevæld® – Coca-Cola’s leading bottled water brand in the Nordic region. Since the campaign began, Danish consumers have committed to donating more than 51 million litres of water to communities in Africa. “This campaign has clearly shown that even small changes in everyday routine can create large results. Thanks to the fantastic support from Danish consumers, millions of litres of clean water have been pledged – those are now helping children and families in Kenya. This underlines the essence of the campaign – you can make a difference,” said Søren Kristensen, Country Manager, Coca-Cola Nordic. The first project to receive funding is the Kimanza Secondary School and Kwasyokimanza Primary Schools in Matungula District. Kenya was chosen by Water For All because of the organization’s deep roots in the country. “In July, the United Nations affirmed that access to clean and safe drinking water is a basic human right. I’m proud and honored to be part of this project that will help provide this right to so many local children to keep them healthy, remain in school, and allow families and the Matungula District to enjoy better heath and a brighter future,” said Mikkel Vestergaard Frandsen, CEO of the Group, Vestergaard Frandsen which created the LifeStraw® product. Segun Ogunsanya, Managing Director, Nairobi Bottlers Limited – Coca-Cola’s anchor bottler in East Africa, says water is the element most necessary for survival and without it; communities cannot be healthy which would then make Coca-Cola business unsustainable. He said through Coca-Cola System’s flagship water strategy program, Replenish Africa Initiative (RAIN), the company is able to reduce its water use ratio, recycle water used in the manufacturing process, and replenish water in communities through the support of broad based projects. “Water For All is committed to using innovative and appropriate technologies to facilitate access to clean water in Africa,” said Jill Rademacher, President of the NGO that is distributing LifeStraw® units on behalf of Coca-Cola®. “We have donated LifeStraw® units here and in other countries and have seen firsthand how suitable and effective the technology is.” Water For All instructs recipients on the use of LifeStraw® units to ensure they are used for maximum benefit. Reduction of waterborne diseases is a major public health goal in developing countries, and the Millennium Development Goal number seven calls for halving the proportion of people without access to safe drinking water by 2015. Point-of-use water purifiers like LifeStraw® are one way to help achieve these ambitious goals. LifeStraw® comes in two models: a personal portable version which filters out more than 99.9999% of waterborne bacteria and 99.9% of parasites; and LifeStraw® Family, an advanced home purifier which removes a whopping 99.9999% of bacteria, 99.99 % of viruses, and 99.9% of parasites. Together, these two point-of-use water solutions allow the user to drink safely and easily—anytime, anywhere. Accessing clean and safe drinking water in the developing world can be challenging, but LifeStraw® was designed to withstand demanding physical environments. 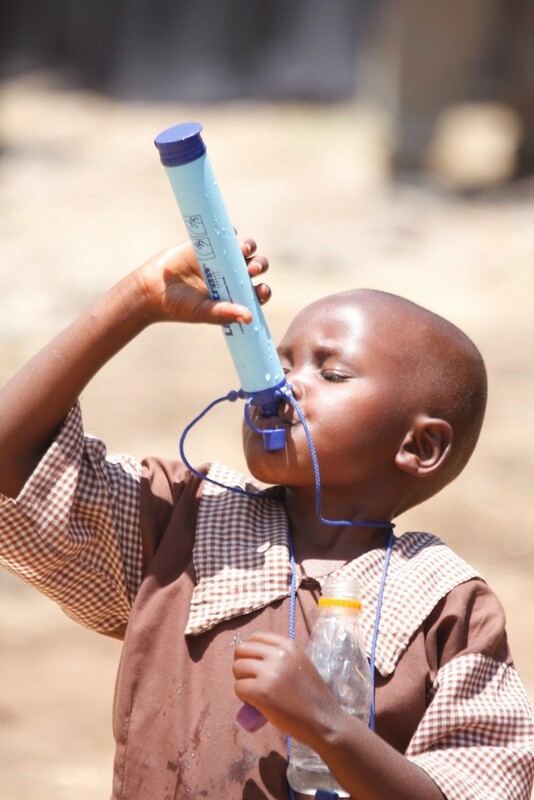 It requires no electricity or spare parts and is appropriate for quick distribution after natural disasters and complex emergencies including the 2010 Haitian earthquake, and the recent severe flooding in Pakistan where hundreds of thousands of LifeStraw® units are now in use. Water For All, a nonprofit organisation based in Johannesburg, has provided access to clean water to hundreds of schools and communities throughout Africa since 2004. As part of Water For All’s approach, the organization works with local communities and in-country advisors to assess each school or community’s water needs and determine if our water technologies will be appropriate for the setting. Water For All currently donates solar pumps, rainwater harvesting systems, and water filtration systems, including LifeStraw® units. Next articleBig brother website can’t handle the traffic! I’m a member of a methodist church that is focused on missions. And this year we are focusing on clean water and the lifestraws. Is it possible to use some of your images in order to promote the lifestraws in our community?